President of Sales and Marketing Tom Justice, left, and President of Construction Scott Schmidt collaborate to lead Legacy Communities' 295 employees, while CEO Steve Been (not shown) shuns the limelight to concentrate on land acquisition. Our 2009 National Builder of the Year is Atlanta-based entry-level production builder Legacy Communities, now operating on a pace to close 1,400 detached homes in 2008 for $265 million in revenue. Even in a depressed housing market, Legacy’s net margin for this year is running at a stunning 11 percent, and the firm has a record of double-digit bottom lines dating to the beginning of this decade. However, financial performance is only a small part of Legacy’s story, which really centers on the firm’s ability to operate in a specialized market niche — African-American first-time buyers — and to move fast to change its product and pricing when the affordability equation shifted for those targeted buyers. Legacy CEO Steve Been Jr.’s strategy has always been to build detached homes of compelling value for entry-level buyers. A third-generation builder, he learned from his father that value in affordable, entry-level homes starts with the land buy and ends with high velocity sales and production. Been, 43, finds the affordable land to follow that strategy and has led Legacy into a remarkable sub-market niche, one where the success formula gets a little more complicated. An extremely private man, Been deflects the limelight and has recently shifted leadership of Legacy to Tom Justice, 47, sales and marketing president who has rebuilt that side of the organization over the past 3-1/2 years, and Construction President Scott Schmidt, 47, who has spent 17 years fine-tuning Legacy’s carefully value-engineered product lines and construction processes. Meanwhile, Been concentrates on land, staying ahead of Legacy’s voracious appetite for building lots. It is perhaps the most important role of all in an entry-level production builder, where sales and construction velocity is the key to affordable pricing. The firm’s long run of stable, profitable growth has been achieved by selling homes almost entirely to Atlanta’s burgeoning population of young, upwardly mobile African-American entry-level buyers in suburbs that ring the city, mostly south of Interstate 20, which runs east to west through the center of town. It’s a surprising strategy for a management team that is entirely white (even though most of the company’s sales agents are now African-American). In a perfect world, like that portrayed in Legacy’s marketing, young families of all races would live together in the same neighborhoods. But Atlanta, like many markets, is not there yet. The city’s tony northern suburbs remain white, for the most part, while something entirely different is happening in the jurisdictions that ring the city to the south. The Rosewood model, shown here at St. Martins Landing in south suburban College Park, Ga., is 3,582 square feet and priced at $210,990, typical of the 50-foot-wide homes that were Legacy's most popular before spring 2007. Click on the above images to view a larger size. It’s mostly in Atlanta’s southern suburbs that Steve Been finds the low-cost land to drive not just affordability, but remarkable housing value. Marketing to minorities is a strategy we believe will work all across this increasingly diverse country. Legacy’s success proves it’s not just the right thing to do, it’s good business. Anderson leads a three-person closing department that champions the cause of its buyers — fighting to get them qualified for a mortgage from one of the seven mortgage lenders with which it deals, and to keep them qualified until closing. “Often, whether they qualify depends on how good their court orders for child support are,” Anderson says. Another major concern is the recent elimination of down payment assistance programs and increase in down payment requirements from 3 percent to 3.5 percent for FHA mortgages. Legacy meets this quandary head-on and proves it can be overcome. Its formula for qualifying and closing difficult buyers can serve as a blueprint to meet the challenge the housing industry will face in 2009, when the entire country is likely to pin hopes for economic recovery on resurgence of new home sales to first-time buyers. The firm starts 70 percent of its homes as specs, which is common among Atlanta-area builders, but Legacy works hard to sell homes as near as possible to completion and the closing date. Prices are lower on homes within six weeks of completion. That helps by cutting the time Legacy has to keep buyers qualified. It allows five weeks to achieve qualification but leaves only one week the firm must keep them qualified before closing. But that’s still a challenge. “Two years ago, most of our closings were 90 to 120 days after the sale,” Anderson says. “Today most sales are within 30 to 60 days of closing. The Savannah model at 2,514 square feet is now Legacy's bestseller, part of the 30-foot-wide product line rushed into production in mid-2007. At the top is an early version. Below, a recent Savannah at St. Josephs in Fairburn, Ga., is priced at $167,990 and shows how Legacy added value by subtly changing the exterior and plan as land prices recently declined. Click on any of the above images to view a larger size. Yet, in most cases, Legacy is able to raise credit scores between contract and closing by working closely with customers and mortgage lenders. “I don’t take 'no’ for an answer,” Anderson insists. “If we get a 'no’ out in the field, we pull the documents together and find out what it will take to turn it to 'yes.’ Then we put together a plan to make that happen. In many cases, all they really need is someone to tell their stories. That’s what we do; we’re storytellers. But we’re able to raise their credit scores before closing on average probably 50 points, sometimes, 150 points,” she says. In some cases, families are multi-generational matriarchal, led by a grandmother as well as a mother, so two income-earners are able to sign the sales contract, which helps the qualification process. What Legacy is doing on behalf of its African-American target market proves qualifying buyers is not an unsolvable problem, even in this era of tight credit. Legacy’s other major attribute is speedy product innovation, which builders from coast to coast may need next year, especially if they plan to target first-time buyers in this era of financial volatility. When the Atlanta market fell precipitously in early 2007, Been, Justice and Schmidt led a task force that designed an entirely new product line of 30-foot wide detached homes to fit 40-foot home sites, that allowed Legacy to get base prices down below $150,000 and keep selling. In a matter of weeks, the firm’s product morphed into a different animal. And it keeps changing, depending on what Been pays for lots. “Before, we sold our 50-foot and 40-foot (wide) homes under our motto, 'Live Big For Less,’” says Been. It was a big-box, price per square foot strategy. “But when the mortgage market began to tighten that spring, we saw the need to move quickly to smaller homes because our buyers would not be able to qualify for the larger ones. One of the keys to our success is management flexibility. We talked about the need for a 30-foot product one night and put the idea into operation the next day.” It was just the reverse of what happened when mortgage rates hit new lows in the mid-2000s and Legacy moved then to larger homes, Been says. “We now have three levels of pricing,” Been reports. “Above the 30-foot product line (1,400–2,500 square feet) that starts at around $140,000, we have 40-foot [wide] homes (1,850–3,100 square feet) that run from about $150,000 to above $180,000, and 50-foot houses (2,200–4,000 square feet) that run from $190,000 to more than $225,000. But I still see this as all entry-level. It’s just that some first-time buyers can afford more than others. Been emphasizes the importance of velocity in the entry market. Continually turning the land fast reduces carrying costs. And when those savings are applied to house prices, the resulting value can increase the sales pace that much more. The challenge is to find ways to reduce construction cycle time to keep up with the sales pace. Schmidt leads Legacy’s continuous process improvement initiative that has pushed average construction cycle time from 101 working days in 2003 to 89 days in 2008. Schmidt cites enhancing the elevations with brick and stone; arched interior and exterior doorways; tile backsplashes; TV niches; and redesigned breakfast nooks, just a few of the design touches added recently to enhance perceived value. The Jamestown model at Summerwalk in Canton, Ga. is 3,105 square feet and priced at $209,990—typical of Legacy's mid-range, 40-foot-wide product line. Legacy developed the 30-foot homes for a 40-foot lot to get its own prices down. But now that it can buy 60-foot lots for less money, the firm is building 30-foot homes on 60- and 70-foot lots. Buyers see the bigger lot as another added value. It’s how Legacy keeps its margins high, when most Atlanta builders are fighting to find a margin of any size. It’s what makes Legacy our 2009 Builder of the Year. The quality and value Legacy delivers in starter homes in Atlanta’s southern suburbs beats what’s available in the northern suburbs. “You just get more house for the money south of I-20, because land costs are lower there,” says Justice, without adding that Legacy’s well-oiled production machine cranks at a velocity others can’t match. The southern suburbs are markets Steve Been has mastered. Legacy is now selling in more than 50 locations, with more on the way, as Been scrambles for every lot takedown and workout deal he can find at the bargain prices he seeks. “What we have to pay for a lot is the key to our pricing,” he says. Ski’s demographic is African-American young adults ages 24 to 40. “That’s the sweet spot of our home buyers,” says Slack, “and an audience that will hit our redesigned Web site, which went live last January. If Frank Ski gets them to the Web site, Legacy believes its Internet Lead Manager can get them to the right community, and its marketing dollars will be well-spent. Been says he’s also intrigued by Florida. “By the time we get Charlotte up and running, Florida may have settled out to where we can move into a market there. We want to take advantage of the opportunities created when land prices are down,” he says. 1. Target Entry-Level: A good market segment for as long as land prices stay depressed. 2. Reach For Minority Markets: Not just African Americans, but Hispanic and Asian market niches abound. 3. Move Fast On Design: When the market says change, don’t dilly-dally. 4. Buy No Land Before Its Time: Never pay more than 20 percent of the projected sale price of a home for the lot. What home builder has the best game plan for next year? 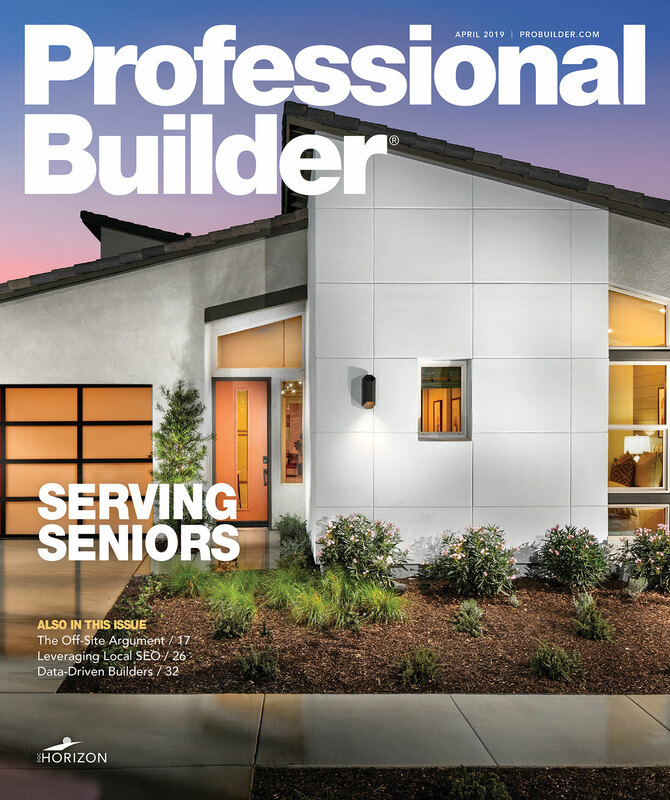 That’s a question Professional Builder editors ask each other every fall as we deliberate our selection for the oldest and most prestigious award in America’s housing industry: PB’s Builder of the Year. The nominating process is open, and judging is done by PB’s editorial staff. We look for a home builder with a business model full of ideas readers can use. For 2009, we considered the challenges for many builders, yet past experience tells us some companies will thrive amid the turmoil of housing markets in disarray. Beyond that, we looked for an innovator on the leading edge of trends that will push housing industry recovery. Our 2009 Builder of the Year had to demonstrate an ability to move fast in whatever direction consumers push housing design and pricing in the New Year. Atlanta’s Legacy Communities has all these attributes and also delivers outstanding features, quality and value to its buyers.